AN Adelaide-based agtech startup has received $500,000 in industry and corporate funding to test a new piece of technology to objectively measure eating quality traits in red meat. The Meat Eating Quality Probe, pictured here, is inserted into a carcase, objectively measuring the intramuscular fat content using laser beams embedded in four probes. At the same time it measures shear force (a measurement of tenderness/resistance, up to now used in laboratories only) in the carcase. The emerging MEQ Probe technology earned a prize in the Pitch in the Paddock agtech startup event held in Rockhampton as part of Beef Australia 2018. The $500,000 in funding support from Meat & Livestock Australia, processing industry partners Teys Australia and the Midfield Group, and MEQ Probe founder, Availer will enable a commercial pilot of the probe technology, which uses nano-scale biophotonics to measure IMF content (proxy for marbling). MEQ Probe chief executive Jordy Kitschke said there was an appetite for a greater understanding around eating quality in the industry, and the trial would allowing his team to put the technology through its paces commercially, designed to bring the probe to a point where it could be rolled out industry wide. “Our technology has the potential to make sure that every time someone buys a steak or a chop, they have a great eating experience, and it lives up to their expectations,” he said. The trial will be conducted at two sites in southern Australia, using 2400 sheep and cattle across different breeds, production systems, and seasons. Manager of industry and corporate affairs at Teys Australia, John Langbridge, said at the consumer end of the supply chain, his company wanted to be able to better predict and optimise the consumer experience. The project will see MEQ Probe test and refine its technology over the next 12 months, fast-tracking its efforts to bring an objective measurement tool to market, as well as leveraging the benefits from relationships with key industry partners. MLA managing director Richard Norton said the industry service delivery company was backing the project that aimed to establish objective inputs in the beef grading system, and give the lamb industry the long-awaited ability to grade on a per carcase basis. 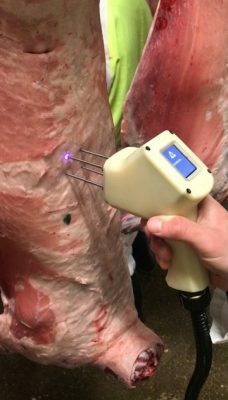 The MEQ probe relies on spectral analysis, capturing the reflectance of light created from laser beams in the probes to determine the meat to intra-muscular fat ratio of meat on a carcase-by-carcass basis, at processing line speeds. Click here to view an earlier Beef Central article discussing various objective carcase assessment technologies under development. Interesting concept, would be keen to see it in action. Just interested to know a bit more about it- so the technology is using ratios of IMF v muscle fibre bundles to predict the eating quality?? If so, how can you ensure the muscle fibre bundles are consistent for eating quality between carcasses?? Let me know if there is a paper/ report on this please.